Sanded Oak Shaker is perfect for anyone wanting to bring their own bespoke finish to create an exclusive look to any kitchen environment. The simple, uncomplicated design combined with the large steel bar handle give an ultra modern, sleek and clean appearance. 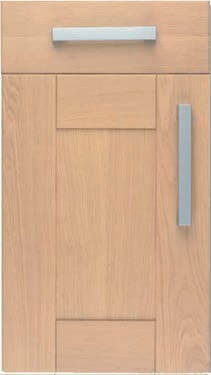 Door Construction: 20mm 5 piece Oak door with flat centre panel and feature joints. THIS RANGE IS SANDED ONLY AND LIMITED ONLY BY YOUR IMAGINATION.